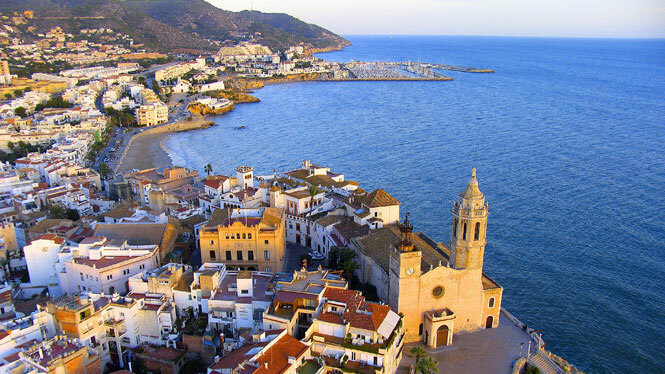 Sitges, located about 30km south from Barcelona, is a town widely known in Spain for its beaches and parties. The story of Sitges starts back in 4th century, when there was a human settlement in the Iberian Peninsula. Its name was given after the Sitges family, who took over the town in the 12th century after the count Mir Geribert. Sitges’ economy was based primarily on the wine production, until the 1960’s post-war economic boom, when it became a major touristic location. Located on the Mediterranean coast, Sitges has 17 beaches that enjoy a mild and temperate climate. It is surrounded by the Garraf’s Park mountains, which makes its climate unique. It is over forty-four kilometers squared that are home to twenty-eight thousand inhabitants. In recent years, the number of the inhabitants increased due to the massive immigration of the new, also foreign, inhabitans. Thirty-five percent of its population is composed of foreigners, mainly wealthy families from The Netherlands and United Kingdom, whose children attend international schools nearby. The city’s infrastructure is very tourism oriented. It has three marinas, being the city with most marinas in Spain. During the past years, economic activities have disappeared, giving priority to the tourism market of the region. Besides tourism, some of the economy is based on fishing, due to its geographic location. As a place that has an old historical background, Sitges still has many historical sites. The most popular one is the Iglesias de Sant Bartomeu I Santa Tecla, the church better known as “La Punta” or “The Tip” for its location on the edge of a coastal hill. It was built in the seventeenth century and carries a mixture of a Baroque and Renaissance style. Hospital de Sant Joan Baptista is another place, worth to visit on your tour around the city. The look at the hospital dated in 14st century definitely fulfill your cultural and historcial needs. The hospital is even listed in the list of the architectural heritage of Catalonia, with a library placed inside currently. If are you interested in the story and antmosphere of the cemeteries, the cemetery of Sitges will attract you. The graves and mausoelums for the whole families are made with interesting alcoves and sculptures in a modernist architecture from 19th century. The cemetery is listed in the list of architectural heritage of Catalonia as well. On your way of exploring the city, do not miss the Monument a El Greco from the 19th century surrounded by the gardens. It is a stoned sculpture of “El Greco”, holding pallete in one hand and a brush in another hand. If you are more museum lover, Maricel Museum or Cau Ferrat Museum in the centre of Sitges are something for you. The expositions contains thousands of items from paintings, Romanesque murals, carvings and atlarpieces to furniture, precious metal, ceramics and porcelain items. We are bringing you one special tip, that you should not miss on your visit – Casa Bacardi Sitges! Maybe you are asking, how is this famous alcohol beverage related to small city such Sitges. The answer is interesting – Don Facundo Bacardi, the native from Sitges, emigrated to Cuba and has founded this famous rum company Bacardi in 1862. As a honour to this man, the Museum of Bacardi was built. In the museum, you can learn about the history of family, their life in Cuba and the production of rum. Really unique opportunity is to visit one of their cocktail classes and you will leave with your own made cocktail! Throughout the years, Sitges hosts many events that attract people from all over the world. The most famous ones are the Sitges Film Festival – a Catalan film festival that was founded in 1967 – and Carnival, the religious holiday that attracts over 250,000 people during its week. Since 2006, also the Gay Pride to encourage the rights of LGBT community is organized here. With large avenues and narrow streets, Sitges is a charming small town. Some streets in the center of the village have exclusive pedestrian and bike access, making a perfect location for a walking tour. To get around the city the easiest way is to walk, since its dimension allows it. Walk on the Passeig Maritim promenade and enjoy the view on the historical city and the light breeze from the sea. For further points like the Playa del Muerto, make your way with a taxi. Sitges disposes of a train station with straight trains to and from Barcelona, which makes it accessible for a day trip during your stay in the Catalan capital. For further inspiration, take a look at our blog and guide, where you can find information about the activities, sigtseeing, nightlife, shopping, food and much more in Barcelona and surrounding cities! SPECIAL DEALS ON APARTMENTS all over the city with Barcelona Home!